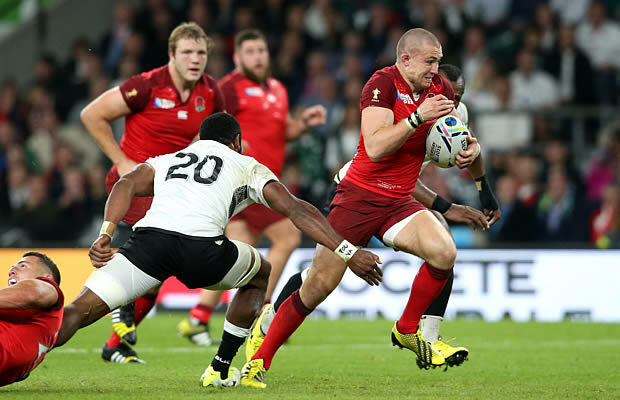 England beat Fiji 35-11 in their opening Rugby World Cup match at Twickenham in London on Friday evening. The hosts gained the all important bonus point in stoppage time when substitute Billy Vunipola was adjudged to have scored by the TMO. A Mike Brown brace and a fortunate penalty try cancelled out Nemani Nadolo’s try for the islanders, in a scrappy affair made frustrating by continued TMO stoppages. It has been billed as the “biggest Rugby World Cup” ever and after an opening ceremony that tried to outdo the London 2012 Olympics, the tournament finally arrived. Most of the previous week had been designed to take the pressure off Stuart Lancaster’s team by certain attempts to make Fiji seem a force to be reckoned with; not an underdog, but a potential banana skin. England started the game brightly when George Ford opened the scoring with an easy penalty and things got better for the home team when Fiji scrum half Nicola Matawalu was yellow carded for pulling down a driving maul. Referee Jaco Peyper issued the card and awarded a penalty try, which Ford converted to take England into a 10-0 lead after 13 minutes. Replays showed that Fiji were unfortunate as there was a hint of truck-and-trailer. England however, could not take advantage as both teams made errors in what were slippery conditions. 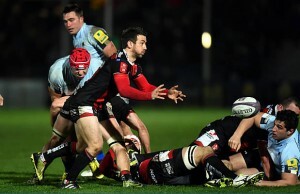 On 22 minutes Mike Brown – who was sublime all evening – scored the first of his two tries. England used quick ball after a disastrous line out from the islanders saw them turnover the ball and the full back score in the left hand corner, Ford missed the conversion, but the lead was now 15. Finally Fiji burst into life when Nemani Nadolo scored from a cross kick after sustained pressure on England’s line. A few minutes earlier Peyper had awarded a try to Matawalu, only to be overturned by TMO Shaun Veldsman prior to the conversion attempt. Replays showed the number 9 dropping the ball after Brown’s last gasp tackle. Ford and Nadolo, who had taken over kicking duties from Ben Volavola, traded penalties and at half time the hosts led 18-8. The second period saw Fiji run out of gas as England seized control of the Test. Volavola reduced the gap to seven points with a 64th minute penalty, but that is as good as it got for the Islanders. Owen Farrell replaced Ford and kicked a penalty before Brown scored his second try, effectively killing the match at 28-11. England could smell blood as the opposition tired and went in search of the bonus point fourth try, which will be crucial in Pool A’s group of death. Just as hope faded England regained possession and after some drives at the line, finally scored through substitute Billy Vunipola in stoppage time. The video ref took an age to inform fellow South African, Peyper, to award the try to relief around Twickenham. in the tightest of world cup pools. 15 Mike Brown, 14 Anthony Watson, 13 Jonathan Joseph, 12 Brad Barritt, 11 Jonny May, 10 George Ford, 9 Ben Youngs, 8 Ben Morgan, 7 Chris Robshaw (c), 6 Tom Wood, 5 Geoff Parling, 4 Courtney Lawes, 3 Dan Cole, 2 Tom Youngs, 1 Joe Marler. Replacements: 16 Rob Webber, 17 Mako Vunipola, 18 Kieran Brookes, 19 Joe Launchbury, 20 Billy Vunipola, 21 Richard Wigglesworth, 22 Owen Farrell, 23 Sam Burgess. 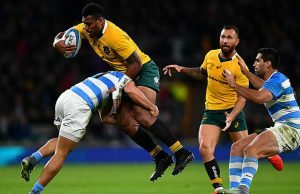 15 Metuisela Talebula, 14 Waisea Nayacalevu, 13 Vereniki Goneva, 12 Gabiriele Lovobalavu, 11 Nemani Nadolo, 10 Ben Volavola, 9 Nikola Matawalu, 8 Sakiusa Masi Matadigo, 7 Akapusi Qera (c), 6 Dominiko Waqaniburotu, 5 Leone Nakarawa, 4 Apisalome Ratuniyarawa, 3 Manasa Saulo, 2 Sunia Koto, 1 Campese Ma’afu. Replacements: 16 Tuapati Talemaitoga, 17 Peni Ravai, 18 Isei Colati, 19 Tevita Cavubati, 20 Peceli Yato, 21 Nemia Kenatale, 22 Joshua Matavesi, 23 Aseli Tikoirotuma.